Preparations for the unveiling of the HTC One A9 continue, as the phone was certified by the FCC in the U.S., and by the GCF. The latter confirmed that the name of the mid-range device will be the HTC One A9 (as if there was any doubt). Already, this phone has been through more than the average handset. It was originally described by HTC co-founder and CEO Cher Wang as a "Hero" phone. And while she didn't say it outright, the implication was that the device would swoop in and save the declining fortunes of the company. Originally called the 'Aero' (which sounds too much like Hero to have been anything but a derivation from Cher Wang's comments), HTC fans unhappy with the HTC One M9 had built up the device into the mother of all flagship phones. One report said that it would be driven by the deca-core CPU on MediaTek's MT6797 SoC. As it turned out, the HTC One A9 is apparently a mid-range handset carrying a 5-inch AMOLED screen with a 1080 x 1920 resolution. The unit is powered by the Snapdragon 617 SoC and has 2GB of RAM inside. The rear camera weighs in at 13MP (with OIS), with a 4MP Ultrapixel camera on the front. A 2150mAh battery provides the power to keep the lights on, and Android 6.0 will be pre-installed. With the One A9 expected to be unveiled on October 20th at an HTC media event, the FCC certified a phone with the model number of 2PQ9100. The 2PQ9 prefix is said to represent the HTC One A9, with the rest of the numbers and letters indicating specific carriers and variants of the phone. The bands on this model (called the A9u by the FCC) suggest that it is a international version of the handset. Model number 2PQ9120 supports LTE bands 2, 4, 5, 7, 12, which are used in North America. Lastly, the 2PQ9300 works with LTE Bands 25 and 26, which are employed by Sprint. Those awaiting the next new high-end handset from HTC, will have to wait until the first quarter of 2016. At that time, we could see the 6-inch HTC O2 phablet arrive. This device is expected to be driven by the Snapdragon 820, and was rumored all the way back in July to be following the release of the HTC One A9. That leak revealed that the phablet will have new features and a unique design language, giving HTC fans some hope to cling on to for next year. I think most of what needs to be said about this offering is goodbye HTC. You were great when you were great and then tumbled into disarray soon after. The M7 was something to build from and you just copied yourself with the M8 while still offering a crap camera. The M9 was what the M8 should have been, maybe. And now some blatant iphone clone? iPhone clone? Then who copied HTC's design in the first place? iCopy. The horizontal antenna dividers on the iPhone 6 are, to my eyes, an evolution of the split rear of the iPhone 5 (metal/glass/metal). And that's a design from 2012. The rest of the iPhone 6 is cribbed from the iPad Air. So I have a very hard time calling the 6 an HTC One copy. 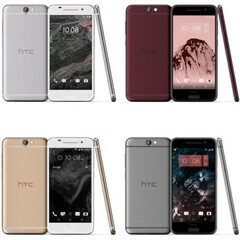 This A9 on the other hand discards HTC's One series design. It's an evolution on the iPhone 6, not the One. I'm by no means an apple fan but it's good to see someone else with some sense; assuming the leaks are accurate it does seem as if htc abandoned their whole design aesthetic! From Hero (M7) to Zero. HTC IMA give you one more chance next year, do or die. My moms M8 is still going strong. I'm sad this is what they're offering the world now. This might be there hero phone after all. If they release it for $200 or less, this thing will really give some low to midrange phones a run for their money. Seriously. All they needed to do was put a good camera in the m8 and get rid of the HTC bar (or just move buttons back on there). That would have been a good yoy update. HTC One M7 was a beast,M8 still was a bit and M9 not. What they need to do is to move back the HW buttons,since they dont want to lose black stripe. Personally i think A9 wont be a hero phone,since the bezels are still pretty huge. I dont care about the screen size,i care about display to body ratio,in this case LG is the winner. If they want success,they got to sell as cheap as LG did with G2. Nobody is making money with android,yes,but with stupid prices like HTC got now they wont even sell. Just gradually make prices higher and thats it,just always keep down from top manufaturers pricing and its fine. The G2 had better screen to body than the G3 and the G3 had better screen to body than the G4. Wow what a copy of the iPhone 6.